Gdansk is a place where history happens. The first shots of the Second World War were fired there on 1 September 1939, and a strike by its shipyard workers in 1980 set off events that brought the Cold War to an end. The mayor’s just been murdered, and at a time when Eastern Europe is looking fraught again, that feels like a true tragedy: not just sad, but ominous. I visited the seaport just over a year ago, and thought it might be worth posting a link to a short piece that I wrote then for the London Review of Books. It wasn’t exactly complimentary about where Poland’s headed, but I loved Gdansk itself – and the town’s vitality and vibrancy was a tribute even then to its principled liberal mayor. In a country that’s got too many villains these days, Pawel Adamowicz was definitely one of the good guys. Four years on from my last post, I figured it was about time to say something again – but anyone who’s got used to the silence needn’t worry, because I’ll keep it brief. I haven’t been quiet for the last four years, just verbose elsewhere, and my various witterings are linked below. The subject that’s obsessed me most of late has been Brexit, and I’ve written six posts on its ramifications for the London Review of Books blog. The most recent is now, for better or worse, a counter-factual apocalyptic narrative, because its conclusion assumed that Donald Trump might not become president of the United States. In respect of the diatribe I wrote immediately after the referendum, ‘Bullxit’, I’m especially proud of my title. ‘Islamic Law in Past and Present’ [book review] (Ecclesiastical Law Journal, January 2017). ‘Codependence Day’ (LRB blog, 19 October 2016). ‘Up the Commonwealth’ (LRB blog, 20 September 2016). ‘Wishful Thinking’ (LRB blog, 12 July 2016). ‘Friending Sarah Vine’ (LRB blog, 4 July 2016). ‘Bullxit’ (LRB blog, 27 June 2016). ‘Back to Europe’ (LRB blog, 22 June 2016). ‘Want to Understand the Appeal of ISIS? Think Like a Young Muslim Outsider’ (Guardian, 18 June 2015). A Short Cuts piece about the UK government’s use of citizenship-stripping powers and its link with US military action against suspected terrorist targets (London Review of Books, 18 June 2015). ‘Koranic Derivatives’ (Literary Review, August 2014). ‘At the CHOGM’ – about Sri Lanka’s hosting of the Commonwealth’s biannual get-together in November 2013. (London Review of Books, 21 November 2013). ‘Channel 4 and Sri Lanka’ (LRB blog, 19 November 2013). ‘Sri Lanka Should Be Condemned – Not Acclaimed’ (Independent, 3 November 2013). ‘Sergei Magnitsky Trial: This is Putin’s Kind of Justice’ (Guardian, 12 July 2013). ‘The Five Techniques’ – about the torture and murder by British troops of Iraqi prisoner Baha Mousa (London Review of Books, 9 May 2013). New Year’s Eve whizzed by too chaotically for resolutions, but had I remembered to make one, it would have been to maintain this site a little more diligently in 2013. It’s been a little too quiet of late, and though that isn’t due to laziness – I was busy writing this report on Myanmar, about which more anon – a couple more posts wouldn’t have gone amiss. I’ll up my game this year. And that’s for sure . . . Anyway, a couple of connected events have at last got me thinking blogically again. I spent the festive break relaxing over a history of modern Somalia (as one does), and the London Review of Books then asked me a couple of days ago to write about Ibrahim Magag, a suspected extremist of Somali origin who was being monitored by the police and now seems to have gone AWOL. My post on their website is here – but tempting though it might be to click on that link immediately, hold back. As I said, the events are connected. The book I read was Mary Harper’s Getting Somalia Wrong, which I’d recommend to anyone with an interest in what’s going on around the Horn of Africa. Harper has spent years covering the region for the BBC World Service, and her account combines interviews and vivid reportage with keen political insight. She’s particularly good on describing the pros and cons of shari’a-enforcement in modern Somalia – and there have been both. Self-appointed arbiters of Islamic law were initially viewed positively by many people, because the rough justice they offered seemed to stabilise the country after years of chaos – but just as happened with the Taliban in 1990s Afghanistan, that promise then turned very bitter indeed. The organisation that is now most notorious for its claims to promote the shari’a, al-Shabaab, would be ludicrous if it weren’t so brutal. Its members consider football matches to be un-Islamic, and have tried keeping kids busy instead with bow-and-arrow competitions or religious quizzes – where participants win prizes that include AK-47s, anti-tank mines, hand grenades and (for the runners-up) office supplies. ‘Never in my life have I seen such rewards’, marvels the compere at one of the contests. None of that is written to demonise Somalia or its inhabitants. I’ve not been to the country (and to be perfectly honest, it’s now slipped even lower on my dream holiday list) but as Harper shows throughout her book, Somalia is a functioning society as much as it is a failed state – and as usual, the very large majority of the extremists’ victims are ordinary citizens, who want nothing so much as an ordered, predictable life. Which brings me, at long last, to this post’s pay-off. The LRB article I mentioned above is about a man suspected of having links to al-Shabaab. If that’s the case, he and I wouldn’t have much in common. Truth be told, I’d very probably find his views discomforting, stupid, naive and unpleasant. But even if a person does support al-Shabaab, distaste, unease and suspicion are no firm foundation for legal action – and upholding that principle is pretty important if we ourselves are to have an ordered, predictable and law-abiding state. And with those cryptic prefatory thoughts in mind, if you can still muster the energy to read my piece, click here. pluralism begins to wither whenever touchiness is allowed to become a measure of lawfulness. Social groups grow competitively sensitive, and cultures shrink into silence or explode into violence. The right not to be offended consumes the rights of people who are said to have caused offence. There are few incentives to take account of a defendant’s intentions, mental capacity and, ultimately, whether the events alleged took place at all. There are at least two ways of answering your question – theological and practical – but both are interconnected. Insofar as anger against the film rests on religious underpinnings, it draws on an attitude to sanctity which, as you know, is common to all three monotheisms. But though the Qur’an warns blasphemers to expect a terrible judgment from God, it actually tells Muslims to ignore insults. Islamic states only imposed punishments very rarely, and it’s only since the Satanic Verses crisis of 1989 that blasphemy has become news. As that suggests, the violence today is a primarily political phenomenon – part of the same huge half-century process that has seen anti-colonialism, wars, occupations, urbanisation and economic grievances fuel the growth of politicised Islamic movements everywhere. That’s not to excuse the terrible murders in Benghazi, but to contextualise them. A mob armed with mortars and RPGs is a symptom of political chaos rather than religious certainty – and it’s important to keep in mind that the overwhelming majority of people who suffer violence in Islam’s name, even in Libya itself, are Muslims themselves. Having had a few days to reflect, a couple of other thoughts have suggested themselves, and in the interests of said contextualisation, I’m going to tack them on here. The first, which will already be obvious to most intelligent readers, is that Muslims don’t have a monopoly on hateful violence. There are Christians in Uganda, Jews in Israel, and Buddhists in Myanmar who’ve pursued their communal interests through brutal means; and though suicide belts are nowadays associated all too closely with crazed Muslims, it was the ostensibly Hindu Tamil Tigers who invented them and used them in vastly greater numbers until the beginning of the twenty-first century. And that leads to my second thought. Any attempt to acknowledge the full spectrum of bad religious arguments is liable to inspire hardline atheists to insist that they prove just how ignorant, or even wicked, it is to believe in God in the first place. At the risk of offending them (and to their credit, offence is at least one thing most know to take in their stride), it’s a dumb claim. Anyone who tries to reduce faiths to the sum of their most violent adherents is failing, at a very profound level, to understand the full extent of the religious experience. If one had to identify a single feature that lies at the essence of all world religions, the most plausible one wouldn’t be hatred, or fear, or even rivalry. It would be the way that every faith tries to instil a degree of humility in the face of the unknown: an awareness of human frailty, an acknowledgement of life’s shortness and the universe’s immensity, a concern to tame the ego before it’s too late. It’s certainly possible to shrink the awesomeness of faith into a belief that God is well served by despising a ridiculous Youtube film, or that He’s the root cause of all our problems. But either way, it’d be a mistake. Spirits have rather risen in London of late, with alfresco Olympian bonhomie breaking out all over town, and I figured it was high time to nudge down my doleful post of last month. 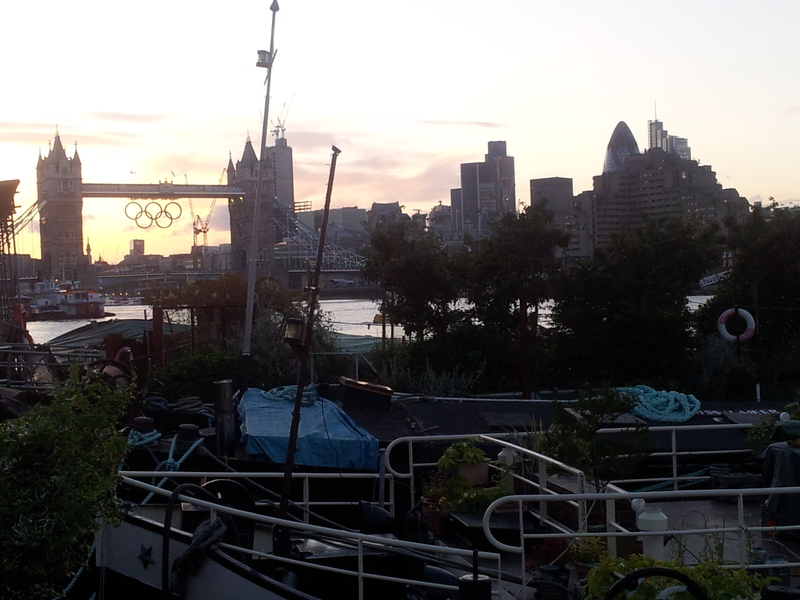 Here’s a happy photo instead, taken from a friend’s houseboat on a warm evening last weekend. Capital! As if London’s feelgoodery weren’t fortune enough, I’ve just had a stroke of personal luck. After several weeks of silence, I heard yesterday that the government of Myanmar/Burma has agreed to let me into the country to research a report about its progress (or otherwise) in safeguarding the rule of law. That decision didn’t come a moment too soon, because I’m booked to fly out tomorrow afternoon, but the important thing is that it came – and now that the door’s been opened, I’m curious as a cat to squeeze on through and look around. I’ll not blog while there, as internet chatter is apparently liable to be misconstrued by the authorities . . . but there’ll be plenty of opportunities in the report to reflect on whatever I find. Meanwhile, to keep things ticking over, here’s a video of the panel discussion on America’s anti-Islamic panic in which I participated last month, and here’s the first paragraph of a (paywall-protected) piece on News International’s phone-hacking exploits that I recently wrote for the London Review of Books. It’s summer in England. Clouds are massing, hail is dropping, and flood alerts are proliferating. In fields up and down the country, cows are recumbent and festival-goers are huddling together for warmth. I managed a brief escape last week – to speak at a conference in Washington DC and watch Fourth of July fireworks in New York (temperature c. 34°) – but I’m now back and hunkering down in the damp for some legal research. Whatever happened to those long, hot, riotous summers we used to know? Anyway, in my melancholy mood, I’m going to wander way off-topic, by posting one of my favourite sonnets and imagining myself elsewhere. The poem is called Love Is Not All, by the American Edna St. Vincent Millay, and it’s rather beautiful. I’m now officially done with trying to hawk my book to America, though I’ve been busily lining up reasons to come back later in the year. 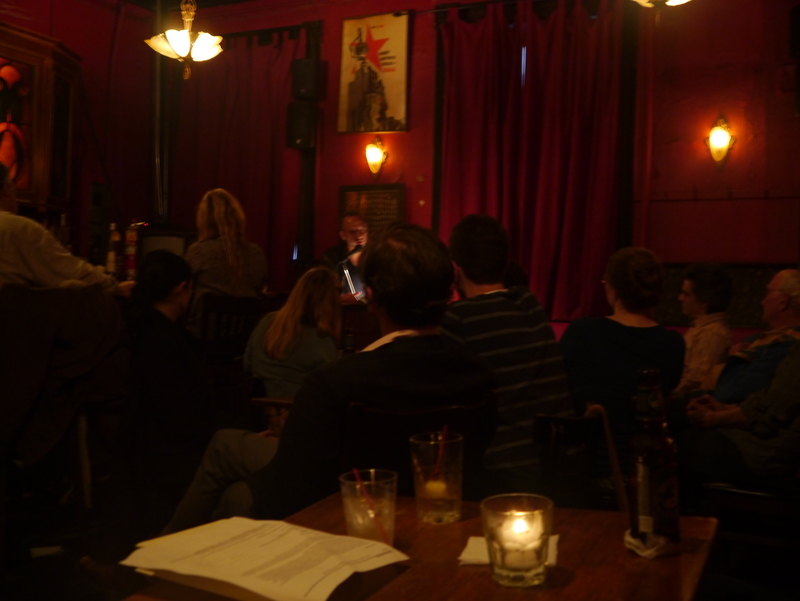 This trip’s swansong came on 8 May, with three radio interviews – including this 45-minute segment for the Leonard Lopate show on WNYC – followed by a reading at the legendarily louche KGB’s on East 4th Street. Below is what part of the room looked like, if the eye and lens of my multi-talented artist-dancer-lawyer-photographer friend Miriam Aziz are to be trusted. Dim though the lights might have been, the venue’s hosted some serious literary luminaries over the years, and I was tickled pink by my invitation to speak there. Great fun was had by almost all, but the saloon-side Q&A came to a suitably chaotic conclusion when someone on a bar-stool followed up a curt question with several lengthy interjections. After challenging various assertions I hadn’t made, he warned everyone present that I didn’t just happen to be wrong about Islamic history; I was deliberately lying, he said, because that is what Islam requires of its followers when they talk to infidels. I tried persuading him he was mistaken, but he was having none of it. Ah well. There’s only a limited amount you can really do to counter that argument . . .
I’m in the United States to promote my book Heaven on Earth, and enjoying it hugely. Over the week just gone, I spoke at stops in Manhattan, Washington DC, Baltimore and Boston last week, and there are dates in Seattle and Chicago yet to come. Early reviews in the New York Times and elsewhere have been very favourable (they’re linked above), and the reception for me personally has also been welcoming. Although the book aims primarily to explain and criticise the repressive interpretations of shari’a that are nowadays ascendant in Muslim-majority states, I’m just as concerned over here to talk about the many attacks on ‘shari’a law’ being promoted by right-wingers in search of a scapegoat. Those attacks draw on popular fears of Islam, and though it would be stupid to deny that some maniacs have done some very frightening things in Islam’s name, it seems just as clear to me that the anti-shari’a activists are pursuing a goal that has virtually nothing to do with the threat of violent extremism. Anyway, Americans who’ve come out to hear me have been genuinely curious to hear my take – and even when they’ve disagreed, they’ve invariably done so with respect. Here are links to three radio shows that I’ve appeared on over the last week: New York’s The Takeaway, a lunchtime programme hosted by Dan Brodrick on Baltimore’s WYPR, and an interview with Terry Gross on Fresh Air. The last is nationally-syndicated, and its broadcast indirectly produced the nicest moment of my tour so far, when a Washington DC cab driver, chatting over his shoulder as I sat in the back seat, suddenly recognised my voice from the show. He turned out to be a voracious reader, and though a university education has remained elusive since he left Ethiopia 16 years ago (‘it is a dream’, he said, dreamily), he was well-informed on mattters ranging from healthcare reform to the debating procedures of the British parliament (in respect of which, he thought things had gone downhill since the retirement of Betty Boothroyd as House of Commons Speaker). And then, when the ride came to an end, he not only decided to come to my talk, but bought my book as well. I’m not sure what he’ll make of it – he was a Jehovah’s Witness with rather firm ideas about divine law – but if you ever read this, Sisay, I’d be pleased if you found my thoughts half as interesting as I did yours. Any writer who wants to stay sane accepts criticism with grace – or at least the pretence of it – but hostile reviews always cause stress. And there’s a flipside. The fresher the memory of slaving over a book, the more you’re likely to empathise with other writers who’ve done the same. That can skew perceptions when it comes to reviewing, in that it’s easy to switch your focus away from a book’s merits and become impressed by the fact that its creator managed to research and write it in the first place. I recently had to deal with the problem in connection with a book by William Shawcross called Justice and the Enemy, which argues that the US should abandon many of its traditional ideas about fair trials and due process to confront terrorism more effectively. Although the thesis is both wrong and dangerous as far as I’m concerned, the effort put into its expression seemed to merit a degree of respect – especially because about the only thing more unpleasant than a self-righteous author is a ranting reviewer. Anyway, if anyone’s interested in my attempt to engage with Shawcross’s very dubious arguments, my piece for the Literary Review is here. I spent two hours on Saturday morning as one of two guest panellists on the BBC World Service’s The World Today Weekend. There’s not much point catching up on old news, admittedly, but I’m linking the programme here and here just in case anyone’s interested in my thoughts on matters ranging from torture in Egypt to Werner Herzog’s contempt for chickens.